그거알아? / You Know What? People are impressed with the achievement of this album because Jaejoong is currently on military service and he doesn’t do any promotion directly. Some say that the sale just goes the same as when he was present and active. Moreover, it just grows and grows as one of the best selling album in so many different countrys recently. Yeah, thanks to all the fans who make it happen. I personally think that it’s such a genius marketing strategy. When an idol goes to military service, fans usually feel lonely. Right when Jaejoong is absent, it’s the time when fans miss him the most. So everything released under his name will win the jackpot. Now, we miss him even more and cannot wait to see him back. For sure, he will shine even more after completing the military service. His first album was such a golden treasure for me. Almost all tracks gradually became my favorites. This time, it feels the same. All tracks are my favorites!!!!! 😀 !! 😀 !! I personally love him in so many different type of songs. 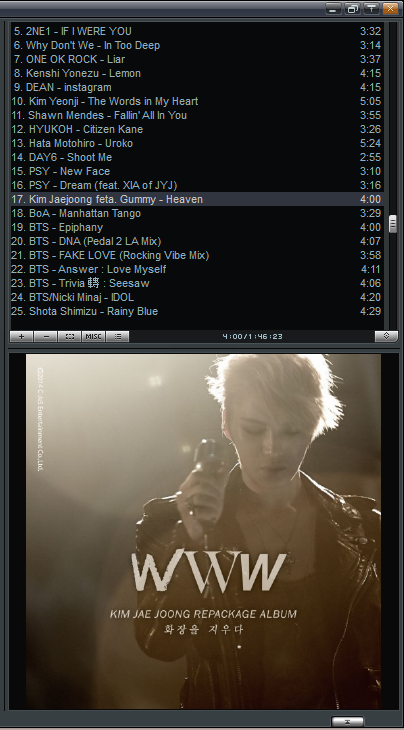 It’s just that I am currently not in the mood for any slow ballad so I put ballad song the least. I love Jaejoong for rock! Having him singing a heartbroken song with rocking style and powerful vocal is just like building castle in the air. Anyway, I feel something is a little darker in this album. Though Love You More is more uplifting than Just Another Girl, I sense something fishy coming through the process. ;), Jaejoong sounds more mature here and the lyrics he wrote are really deep. I think my top most played tracks end up displaying a pop-rock gloomy aura. Breathing is a about daydreaming. When the intro starts, I feel like my brain is struck by mindblowing air coming through the window. The feeling is like inhaling and exhaling a fresh air in the meadow under the sunshine. There are so many interesting things about this song. The music is also quite new for me, I never heard him singing a song like this before. At first, I even thought that his vocal reminded me to Brian Joo a lot. There are several funny things about the song “Love You More”. The first time I saw the title, I thought it was a cover of Junsu’s song. Wkwkwk! Hell it’s not. The second thing was I misheard the lyric. The first line goes like “neomu gadanhae” but I thought it was “neomuga Darling~!” So I kept singing like that until I found the original lyric. I felt so clumsy that I was not really into it at first, but the song kept me dancing randomly with the uplifting beat. I just love this song more and more! Good Morning Night is like a life soundtrack for my daily life. The music is so catchy and makes my heart goes wow! It simply brings some positive mood up! My first impression about Drawer was really strong. The melody is sickening! It strikes my heart deeply and I slightly remember a lot of fuzzy things about the past. Yeah, it’s a good song to recall some old beautiful and bad memories in your life. In contrast, You Know What? is a sweet and happy song that always makes me smile. While Good Luck was previously a whatever song for me, now both of them really make my day! Those are my instant moodmakers!